8Rental invites to hire up-to-date chauffeur driven vans in Manchester at cash-saving & meeting customer's expectations rates. 8Rental's desired outcome is a guarantee of reliable & safe passenger transportation on Manchester roads & Greater Manchester towns' streets. Hustle-free ride, relaxation, reliability- fundamental basics of hiring 8Rental's minivans and minibuses driven by hard-working flexible chauffeurs! 8Rental's enthusiastic stuff involves responsible drivers, well-informed of Manchester directions, places & routes. Being Ok with booking terms & conditions from 8Rental you hire firmly the best North West's chauffeured van supplier! Manchester's responsible energetic chauffeurs are disciplined, time-tested & totally licensed. 8Rental's office can make all arrangements to take your group anywhere you desire; whether it be a day trip or an overnight excursion. If you have a meeting or simply wish to travel throughout Greater Manchester's cities, like Bolton, Oldham, Stockport, Bury or Rochdale our chauffeur driven minibus hire service is available 365 to help organizing your trip. 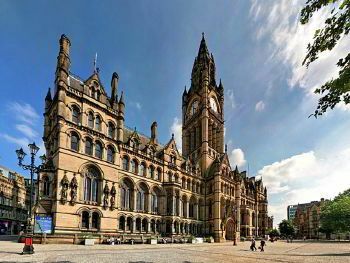 Visit John Rylands Library, Chill Factore, Heaton Park, Peak District or travel to Fletcher Moss Botanical Garden. 8Rental's dedicated professionals staff will work diligently to understand customer's travel needs in order to recommend most appropriate minibus. 8Rental is absolutely first choice for great service because the company has a reputation for providing a modern, clean & diverse minivans and minibuses fleet. 8Rental's dedicated to making each customer's experience memorable through high class transportation with qualified drivers. Looking for a minibus hire in Manchester with driver? Let 8Rental Reservations be your number one choice! 8Rental.com is at your disposal 365 days a year! Hire a minibus in Manchester with driver easy & secure!